This was one of my first properly functional shell scripts and, wow, I actually quite like working with shell scripts. They are versatile and reliable and also fun to write. I had to look up a few different things while developing the script and learned quite a bit in the process. You're probably thinking at this point that I've written something complex but I really haven't - I'm just a bit of a shell noob. The script uses python to parse the JSON response (thanks to this useful SO post) from the plug into different variables and then simply appends them to a csv file. It does this in an infinite loop with a configurable delay. There's details on how to use the script in the repository's README.md and of course it's all there for you to pick apart and tell me how my syntax is all wrong... If you have any trouble getting it to work properly, or just even end up using it let me know in the comments or on Twitter! Once you've logged the energy consumption for a certain time period, you can import the file into excel and use the tools to plot power over time. 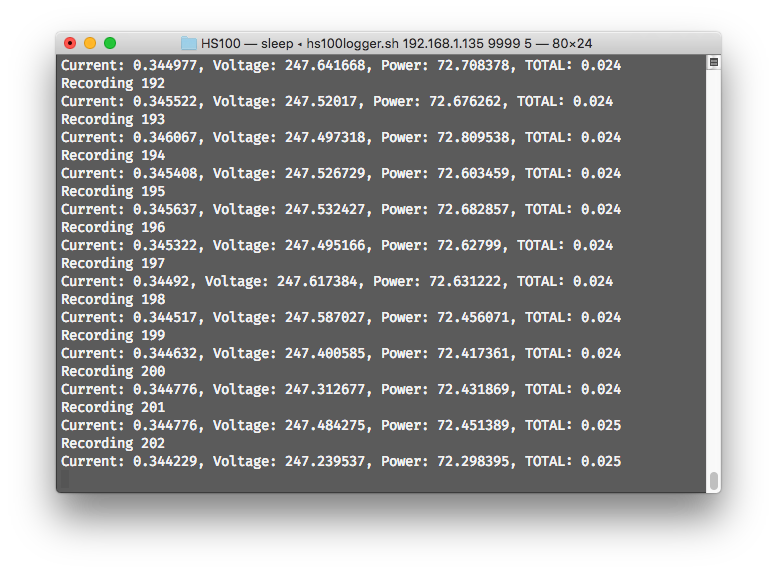 Below is some data that I gathered from different appliances. I played the new track Big Man by Childcare on my speakers while recording power every second. 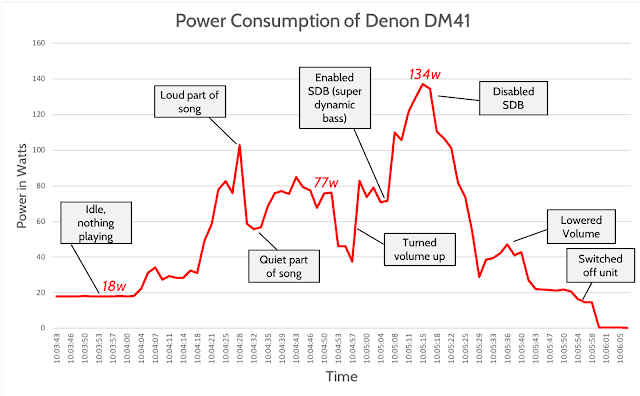 At one point I enabled SDB (super dynamic bass on my Denon DM41) and noticed a large increase in power consumption. These key points are labelled on the graph. 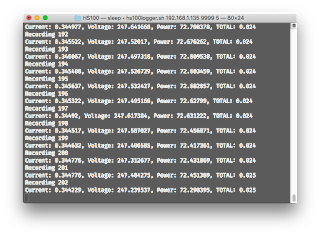 This is 14 hours and 45 minutes worth of data from our garage freezer, in which it used 0.562kWh. This has helped us identify how often the freezer is using power - it runs for an hour and a half and then rests for just over an hour. Here's the graph of a 10 minute session with the plotting resolution set to 1 second. Note the peak in consumption when the vacuum is switched on.